Welcome to the Supreme Tools News Page! News from around the engineering world is shared here along with local and Supreme Tools news. New additions! With a growing customer base and to fulfill our customers needs, Supreme Tools has appointed Chris Perkins and Shane Turrell to join the Supreme team. Chris will be joining our ever busy tele-sales team, and Shane will be primarily organising and running the stores at Supreme. But, with an ever increasing demand for supplying in a timely fashion to our customers, Shane will also be out delivering when needed to ensure our customers get deliveries as early as possible each day. 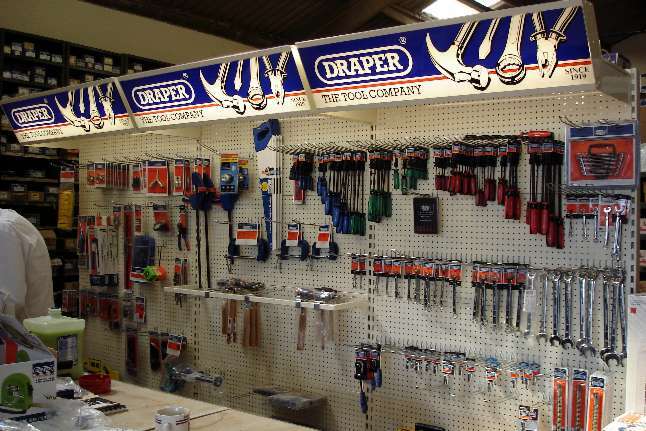 Supreme Tools' awareness of our customer needs has led us to install a Draper handtools display unit. Supreme Tools Supplies are an appointed main distributer for Draper Tools. Whilst we constantly stock over £2000 worth of Draper handtools (see picture above), we can also supply on a next day basis - anything in the Draper Tools catalogue. If you require the Draper Tools catalogue, please visit the 'contact us' page of the website, and email your request to us.